Over a week into January and I am still feeling the post holiday hangover - sluggish, tired, and blah. It most certainly is hard to get back on track after overindulging (maybe a little to much) throughout the holidays! One of my resolutions is step up my game in the health & wellness department, and since I know I am not the only one with that goal, I thought it would be fun to share one healthy recipe a week for the month of January! The recipes I will be sharing are all quick, easy, and of course healthy but ones that don't sacrifice taste. They are meals & snacks that I eat on a regular basis and that make me feel good about what I am putting in my body. What could be better that that? I hope that you enjoy them as much as I do and incorporate them into your healthy lifestyle! 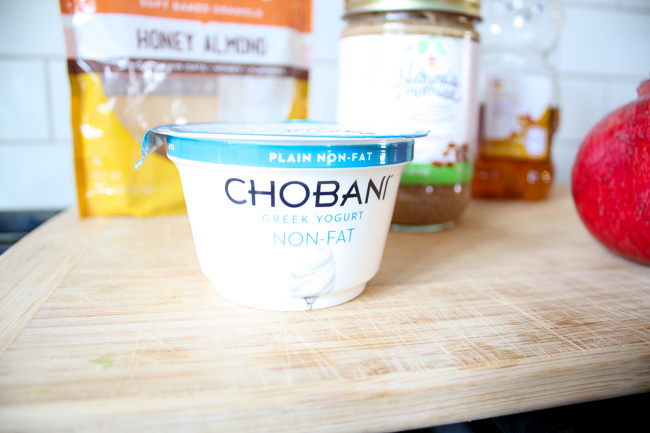 I'm not going to lie, the combination of plain greek yogurt and almond butter did not appeal to me at first. I remember thinking there is no way those two things could taste all that great together, and honestly had no intention of giving it a go to find out. However, for whatever reason I decided to give it a try one day, and let me tell you... YUM. I was so pleasantly surprised at how wonderfully the two flavors blended together and have been eating it ever since. 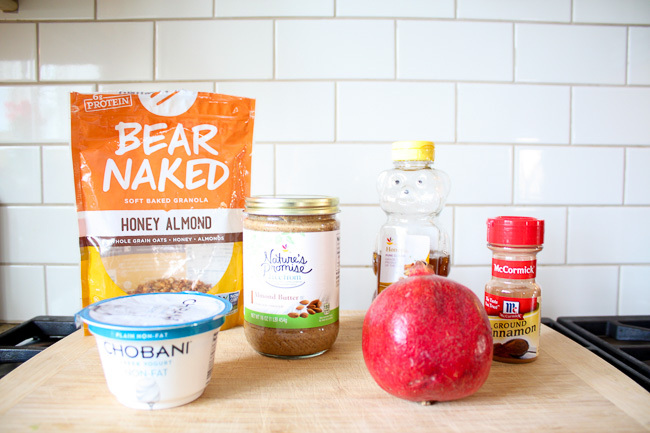 It has become one of my go-tos for breakfast, but it also makes the perfect post-workout snack or light lunch. As you can see from the above photos I was planning on using a pomegranate, but when I went to cut into it, it had gone bad. I decided to substitute in strawberries instead because I had them on hand, and it was just as delicious! Apples are another one of my go-to fruits for this recipe especially in the fall, but any fruit will do. If you're not a huge fruit person, it is equally as tasty with just some granola sprinkled on top sans fruit. 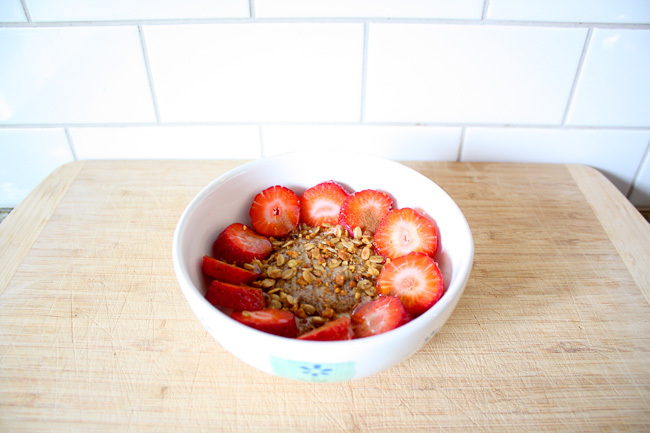 I've experimented with different toppings, but my favorite has definitely been pomegranate seeds and granola! The pomegranate adds just enough sweetness, and the granola is the perfect crunch. 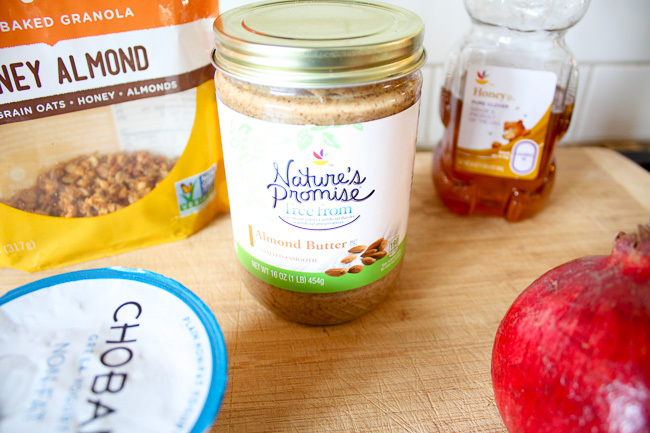 Drizzle on a little bit of honey and a hint cinnamon and you've got the perfect healthy treat!